This delightful one bedroom ground floor apartment is located close to the beach in Prodromi, between Latchi and Polis, and is within easy walking distance of both the beach and local shops. 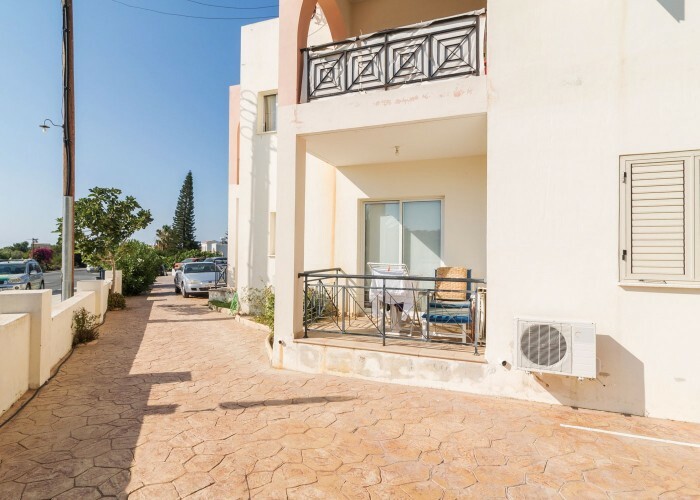 This is the ideal investment opportunity suitable for both long term and short term rentals and for the owner to use as a holiday home. It comes fully furnished. Surprisingly spacious it boasts allocated parking, the use of a very attractive communal pool, and delightful mountain views from both the veranda leading from the bedroom and the large patio at the front of the property. The joy of both of these is that they are west facing so they are ideal for watching the spectacular sunsets over the western tip of the island. Just imagine sitting here on a sultry summers evening watching the blazing sun disappear over the horizon while enjoying a traditional Cyprus brandy sour. The very large bedroom enjoys plenty of wardrobe space and full air conditioning as well as the aforementioned patio. Directly opposite the bedroom is the generously sized bathroom, attractively finished and complete with bath and overhead shower. The beaches at Latchi are within easy walking distance and the nearest kiosk can be reached in less than 5 minutes.